In sequel to my most recent post, on to the experience of actually skiing those craggy, cavernous alps that stretched into the sky. So, to pick up where I left off, after I had been woken by my mother on our first morning and raced down the deserted streets of Zermatt on my own in the frigid early morning air to see the Matterhorn in all its unobstructed glory, I returned to the hotel room to shower and eat before we hit the slopes. We walked through town wrapped in our heavily insulated ski pants and jackets, past the alpine chalets, the narrow streets, the snow covered mountains rising up on either side of us, and through the tourist jammed streets of downtown. We made our way into one of the many shops that offered equipment rentals. Snow sport in Switzerland is nothing like in the US. In the US, the process is often stilted and complicated, offering just one location to pick up ones equipment rentals which equals long lines at the beginning and end of the day. In Zermatt, one could wander into any shop selling winter gear and snag some rentals there as well. A much more convenient and streamlined process to be sure. Easy as pie. The equipment was also the exact same price has rentals back in the US but was far better quality. So we sauntered in and grabbed the gear which we had stopped in and ordered the night before while wandering through town, post-dinner. A brief walk next door to the rental shop put us at the Gornergrat railway. This is the tallest railway in Europe, bringing one up a mere 10,000 feet (did you catch my sarcasm in that statement?) into the very heart among the tops of the Swiss Alps. We hopped aboard and watched together in awe as the train climbed along the edge of a mountain, seeming to circle the village of Zermatt as it wound its way slowly up into the cliffs above us. We had a stellar view of the town spread out below us with the Matterhorn as its focal point. The train wove its way through a small forest, the ground a blanket of white. This whole ride was utterly breathtaking. 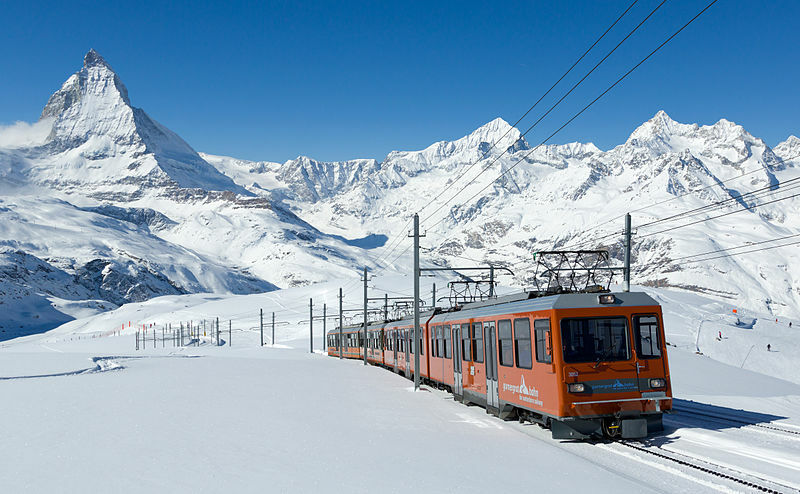 This is a picture of the Gornergrat train (not taken by me), but here is what it looks like from the outside and thus, the exact train route WE rode!!! After some minutes, we emerged from the forest and were in a world that had been white-washed. The wind blew hard, snow swirled in billowing drifts atop the looming mountains on all sides of us. Yet the train continued to climb. My heart began to pick up speed slightly, both due to the height, the loss of oxygen when one is up that high, and the dizzying drop of the sharp and steep edge we moved alongside of. Trying on a helmet for size ;-) and safety of course. On board the Gornergrat train, about to ascend into the Alps!!! The view of Zermatt as the train climbed into the sky. At the top. After snapping a few photos, we strapped on our skis and got ready for the ultimate in skiing. THIS. Is our ski trail. THIS was our view, the entire time we skied. Inside the Worlds Biggest Igloo. We stopped for lunch. THIS was our view and where we ate. Possibly the best ambiance and deck location ever for an outdoor restaurant, eh? See the person in the white jacket and black pants? That is me :-D Skiing off into the heart of the Alps (the dude in the black jacket? Random photo bomber). Check out that insane rolling cloud alongside the ski trail!!! How cool is that??? I was skiing leisurely, happily, unaware, and well ahead of my Mom. Apparently she saw that I was headed straight for a black diamond, totally unbeknownst to me. She called out to me but her cries were lost in the wind. I skied on forward, totally clueless and lost in the adrenaline filled joy of being on the slopes. That is, until my skies slid over the edge of the cliff that was the beginning of this black diamond trail. I looked down, my heart lept into my throat as I stared down at the steep drop below me. I looked up, searching for my Mom. She was nowhere to be seen, and I was already too far down to take off my skis and walk back up. It would take forever. I wasn't sure I could manage this trail though. It was a near vertical drop, much of which was ice. I begin making my way down, muttering to myself in annoyance as to where my Mom had disappeared off to. Mid-way down the trail, after a few near misses when my ski caught and I very nearly spun out of control, went off the trail or dive-bombed down it which surely would have resulted in broken legs, I stopped, craning my gaze back the mountain. Where on earth is she??? I wondered. What could she possibly doing?? I sighed with resignation, assuming she was having some major trouble. I couldn't wait to laugh with her once safely at the bottom about how INSANE that trail had just been, huh? I put my skies parallel to the trail at this point and proceeded to skid my way down, skies vertical against the trail. It was just too steep. Finally, upon reaching the bottom, my face tomato red and covered in nervous sweat, finally able to allow myself to relax, I waited for her. I spotted her skiing her way around a leisurely bend, NOT the trail I had just come down. I asked her in shock "where on earth were you?!" "Oh, that was a black diamond," she responded. "No way was I going down that one." "Yup. So I let you go on down ahead and decided to go an easier route that I wouldn't kill myself on." "Wait. Why didn't you call out to me?? That was a terrible run. I had no idea it was a black diamond. So you just thought to let me kill MYSELF then?" "I called out to you," she said, "but you didn't hear me." Sarcasm aside though, we laughed about that for the rest of that day. This became one of the hilarious moments we recounted throughout the rest of the trip (of which there were many). This was the BEST ski run of the day. Hands down, the most craggy, awesome, awe inspiring view, as you can see above. And it was our last ski run of the day too, fancy that. Best for last, that's for sure. Speaking of which, on this last run of the day, my Mom decided we would cross between the two sets of Alps. We had been on one side of Zermatt skiing for the day and decided to take a gondola across to the set of mountains on the other side. This gondola ride was awesome by the way. Incredibly terrifying, totally unnerving, the views were spectacular. She assured me that we would not go down the ultra steep trails we had seen people taking on this side of the mountain, from far away within the safety of our gondola. We would take easier trails, she assured me. Except, we didn't. We took exactly that steep trail, which SHE led us down no less. After snapping the awesome set of photos you see below (scroll down), we set off down the mountain. Our last run of the day. My Mom led the way on this one, as she had assured me she would take us on a nice, leisurely route. Until my skies screeched over the edge of yet another demon drop. I looked down and though, what the f*ck. How on earth am I going to get down this trail? Its INSANE. Mom was already halfway down the trail ahead of me, so I had no choice but to follow as we didn't want to lose each other. I still hadn't gotten up the guts to begin my descent on this death-wish of a trail just yet, so instead I watched her making her way down. Until she fell, and then rolled, and then rolled some more, and I watched skies flying into the air and poles flailing. I could do nothing but watch, torn between gut-bursting laughter and heart-wrenching terror as I watched as she rolled her way down the hill. Finally, she came to a halt and sat up. She shook her head and looked around, appeared to be unhurt. A few men stopped to offer her a hand, I saw her smile and wave them off. All appeared to be well, so I allowed myself to laugh uncontrollably, finally, because her snowball style roll down the mountain had been an utterly comical and hilarious one. Now back to my own dilemma. I was still stuck at the top, terrified to make my way down. I sat down for a moment right in the middle of the trail, allowing myself the delusion that someone might help me miraculously make my way to the bottom without having to risk my life skiing it. A man stopped and asked if I was alright. "I...ummm...yes, I am thanks," I answered him with a smile, having briefly considered telling him I was unsure how to get to the bottom but then resigned myself to getting up and pointing my skies downward, praying that I would make it to the bottom in one piece. I did. However once again, covered in sweat, trembling, and muttering any number of expletives on my way down as my skis caught on chunks of snow, spiraling my out of control momentarily or upon finding myself going too fast, feeling terror enter my racing heart as I questioned how to stop without barreling into a tree. All jokes aside though, skiing the Alps was OUTSTANDING. We agreed, a better view? Not possible. Skiing here for beginners or the faint of heart? Absolutely not, we agreed. My Mom and I had two totally fun races down the mountain together. This was a BLAST. I won the first race, she won the second. Both races were fast, each of us barreling down the hill like side-by-side bullets, making figure-eights alongside of one another, speeding past one another only until the other caught up, and vice versa. We had such a ball. I loved every single minute of it. Best views of the day for last. THE trail of the day. See the tiny black dots of skiers far down on the trail??? We skied down this trail as well. With THIS as our forefront view. Taking a breather :-) and drinking in the view. And back down on solid ground again. We decided another meal of calorie laden, cheesy, rich, homey goodness was exactly what the evening had in store for us. So cheese fondue was on the bill for the second night in a row. We had a great time this evening at dinner. Mom was loving the view of the town streets outside our window, the city coming aglow slowly as dusk felt, the narrow street and alpine huts on either side of it, the snowy mountains as an ultimate backdrop. We laughed and recounted our awesome day skiing, we talked about life dreams, relationships, longings, favorite foods and more. This was lots and lots of fun. We stuffed ourselves until near bursting. This meal was the bomb. Then we headed our in search of tea and cake, though I nearly passed out in my cup from ski-induced exhaustion. Finally back in the hotel room later on, Mom wrote in her travel journal for a bit and I snuggled into a book I was currently engrossed in, The Opposite of Loneliness by Marina Keegan (which was very good, by the way). How cute is this?? The check came in this little wooden box. Sunburnt from skiing and loving the cheese fondue. Breakfast at the hotel!! So yum. And now for the train ride from Zermatt back to Vesp. We got to take the incredibly scenic, awesome train ride twice!!! How lucky were we?? Check out the following pictures from our train ride home. Look at that water color??!! Incredible pics, and quite a story! I know. Isnt it??? Hands down the most amazing views of my life, without question.